If you are interested in exploring dynamic offers, modern merchandising and NDC-enabled distribution, meet the Farelogix team @ Aviation Festival London 2018 (5 - 7 September). To book a meeting click here. As the Farelogix team prepares for the Aviation Festival in London, I’ve been thinking about the importance of happy customers to airline profitability. Of course, my thoughts led to Amazon. Why? Because Amazon’s relentless focus on the customer experience, and the ability to turn that into loyalty, is so powerful that it positions the e-commerce giant as a potential disruptor – in any vertical. In fact, in an annual letter to shareholders, Amazon CEO Jeff Bezos revealed that there are 100 million paid Prime members globally. That’s a lot of people to sell to! So, how did Amazon become so successful and feared? 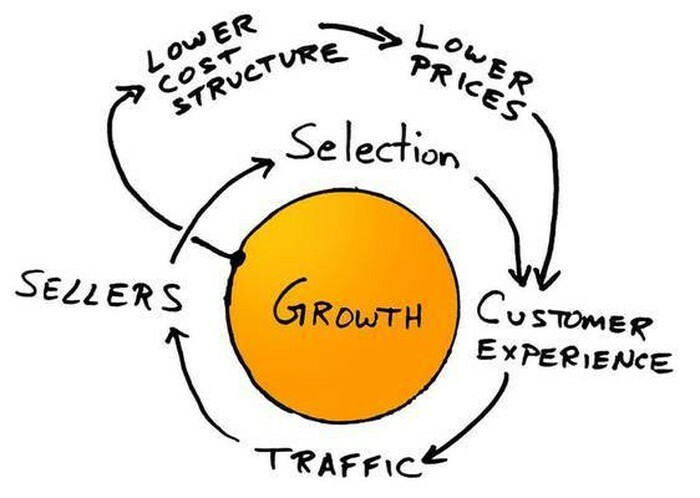 What can airline commerce learn from the Amazon Business Model? The answers lie in the Flywheel and happy customers. Central to the Amazon business model is the concept of the Flywheel. It’s a business model designed to build on its own positive momentum. Thinking about this in the context of airline commerce, can the emerging area of dynamic offers enable airlines to build a synergistic momentum of happier customers and more revenue? The answer is ‘yes’. Deliver more customer value – Bring the offer closer to the customer’s need with dynamic offers of flights and ancillaries. Consider all offer elements including price, product, placement, and timing to make the offer desirable and unique. This applies to both direct and indirect channels. With GDS adoption of NDC, and the snow-balling number of real-world NDC implementations, NDC has reached a tipping point. The ability for all airlines to control their offers across all channels is here. More value leads to happy customers – Generally speaking, the more value an airline brings the customer, the happier the customer will be. Of course, not all customers will value all offers equally. For some, value may be a rock bottom fare even if it’s on an extra-long connection. For another, it may mean the ability to pre-purchase a seat on a partner airline. For others, it might be customized ancillary bundles for all their corporate clients. Find the sweet spot, differentiate, and delight! Happy customers mean more sales – Once satisfied they have a valuable and unique offer in their hands at the right time (and from a brand that they trust), happy customers will likely buy. Value and great experiences stimulate purchases and generate positive word-of-mouth awareness. In addition, they contribute to new and renewed sales contracts. More sales leads to richer insights – In the hands of data scientists, revenue managers, and e-commerce executives, more purchases mean more data. Equipped with tools from classic revenue management to artificial intelligence/machine learning, these experts will use this data to mine richer insights. Richer insights lead to more customer value – Fueled with richer customer insights, an airline’s commercial team can focus on generating more finely-tuned customer value. With new generation offer engines, they will use this data to create and optimize the offer ‘on-the-fly’. This leads to more happy customers. At Aviation Festival London 2018, we will examine how dynamic offers lead to happy customers. If you are interested in this topic, schedule a meeting with a member of our commercial team by clicking here or the button below.